Returning to Chorlton's Dulcimer for a third time. Brilliant northern beat poet, with a musical side project; Corporation Pop . 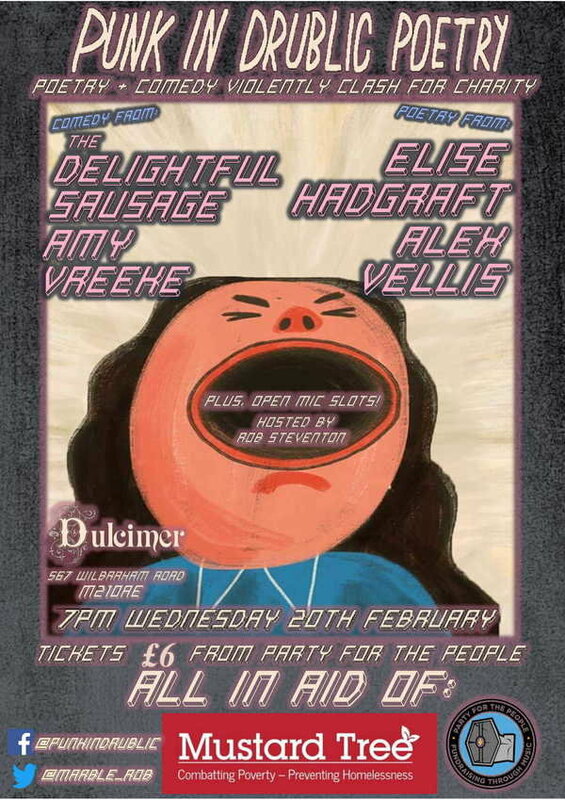 Elise started out under the name Annie Phetamine more than a decade ago, and has since been a massively prominent figure on the UK spoken word scene. She'll have her new pamphlet 'Protection base racket' released soon. Massively widely acclaimed Canterbury based wordsmith with a tonne of accolades and achievements under his belt. 2015 Wise Words Grand Slam champion, with his 2017 debut show 'Everything is Terrible' being greeted to sold out crowds. Alex has supported Kate Tempest, Dan Simpson & loads of other cool people. Hosted by MC Rob Steventon. There is also an open-mic section. Apply for a slot through the PIDP facebook page. In addition to the brilliant bill, we'll be hosting a huge charity raffle with massive prizes. All, as ever, is in aid of Mustard Tree - a brilliant charity alleviating the plight of Manchester's homeless & impoverished.